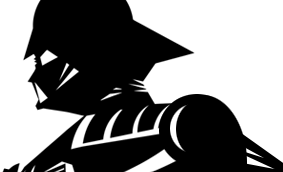 This figure first appeared on the Return Of The Jedi 65 back card. Due to Lucasfilm’s desire to keep the Ewoks’ appearance a secret, the Return Of The Jedi 65A card backs had both this figure and Chief Chirpa blacked out. Despite this, Logray was still released on the Return Of The Jedi 65A card. Comments: A lot of people may say that the Ewoks were pushovers, but if the vintage Logray (Ewok Medicine Man) is any indication, nothing could be further from the truth. If anything these dudes are creepy… really creepy. We’re not talking Michael Jackson’s nose creepy… We’re talking that The Shining creepy. (The Kubrick film, not the lame made-for-TV thing with that guy from wings) And good ol’ Logray takes the cake. Yup, he’s creepier than that zombie witch doctor dude in The Serpent And The Rainbow. 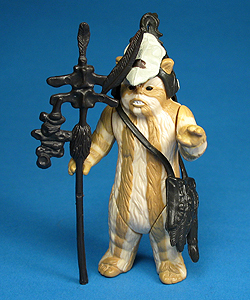 Major Variations: Though all vintage figures have minor variations, the Logray (Ewok Medicine Man), for the most part, only has spray op colour variations. The figure is available with light tan, dark tan, and gray stripes.